“The Richmond Mariners are a U14 Boys fastball team who qualified for the Western Canadian Fastball Championships taking place in Prince Albert Saskatchewan August 2-5. The next order of business was to deal with the large expense of sending a team to play in a tournament in Saskatchewan for 4 days. After hearing about a very successful clothing drive at a local school in Richmond which was supported by Trans-Continental Textile Recycling a small group of parents decided that a Clothing Drive was a fast, fun and low maintenance way to raise funds for the team to travel to Saskatchewan. So the organizing committee made the call to Transcontinental to begin the planning and organizing of the Clothing Drive. The committee got all of the other parents organized into calling all their contact in their network. 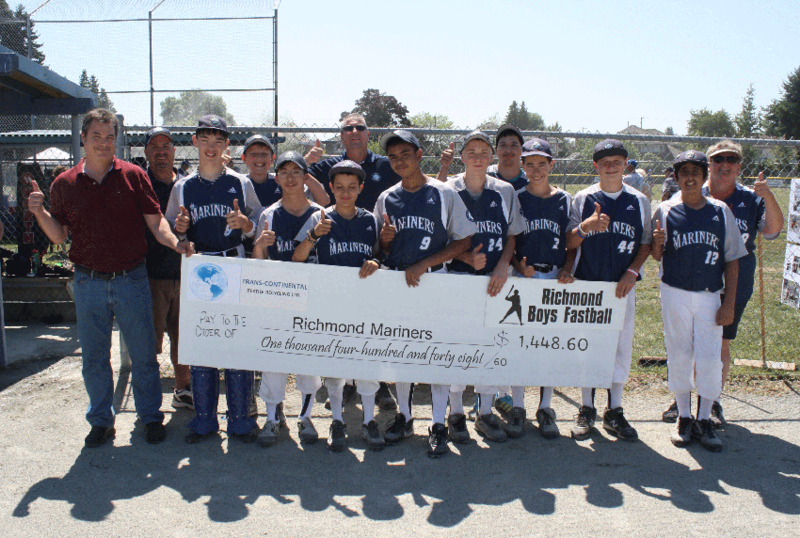 After 3 weeks of collecting clothes in the garage of one of the parents homes Trans- Continental pick-up the 6,100 pounds of clothes from the garage and the next business day Trans- Continental was very proud to present this cheque to the Richmond Mariners for $1,448.60. The Mariners had a great time at the tournament and placed 5th. Congratulations to the Mariners for a Great Season. © 2013 Trans Continential Textile Recycling Ltd.